I used to have to drive 300 miles to find the nearest Jimmy John’s sub shop. Every chance I got, I did just that. I love Jimmy John’s. I’m getting hungry just thinking about it. For many years I’ve stopped in the Jimmy John’s in St. George, Utah for my fix. I pass through there a few times a year. Finally they have some stores here in my hometown and boy am I happy about that. I almost always get the #9, an Italian sub that is SO good I can hardly stand it. The bread is fresh, the ingredients super and the flavors with the Italian dressing are off the charts. I occasionally get “slim Jims” which are smaller sandwiches with just the meat and bread. Still very good. #9 sandwich. Had to take a bite first before I took the picture! 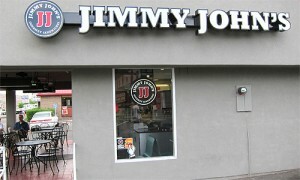 For many years when traveling south, I’d eat at the St. George Jimmy John’s and get my frequent diner card punched. I filled up two of the cards over several years of patronizing the store. It finally came time for me to cash them in last month and the lady at the cash register said they no longer honored that program. Massive FAIL! I’d been working on those cards for YEARS! BOOOOO. Despite that really big bummer, I’ll be back. The food is too good to pass up. I never miss a chance to eat at a Jimmy John’s. They are simply one of the best sub shops on this planet. We love Jimmy John’s. I’m a #10 lover. I’m also a lover of Boise Ranch Rubs.